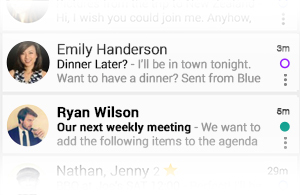 How can I Differentiate Read/Unread Status for Emails? /Basic Actions /How can I Differentiate Read/Unread Status for Emails? The empty circle is read, and a filled one designates an unread email. In addition, the sender and subject of an unread email will be bold. The color itself identifies the provider and helps you prioritize when using Unified Inbox so you can easily figure the account of that email. You can Change the Read / Unread Status of the messages.